Each image speaks to me in a unique way or takes me back to a specific moment when time stood still – photography is like that! However, some definite themes become apparent. 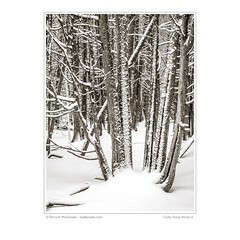 Those of you familiar with my work will recognize my love of nature: wide , three dimensional landscapes with strong foreground elements as well as close-ups of flora are common themes in my work. I also look for the dramatic and try to be in places when nature is at its best. Three examples of that are Ice Wall, Webster’s Falls, Storm over Bow Valley, Banff and Magenta Dawn, Waterton Lakes. No doubt, being in dramatic places inspires artists like myself, but I still find it difficult to truly capture the essence of a place just because I’m there on a particular day. Lucky for me, I have a willing and able friend in Kerry Little who enjoys just getting out to see the world around us (e.g. both Ice Wall and further below Icefall, French River). I also have an accommodating family that enjoys evening drives and patient waiting (for Storm) and are not disturbed by my 5am departures from the tent (for Magenta Dawn). Then there is the sublime – photographs that represent scenes and subjects we might just walk by without noticing. These are especially important to me as they more closely represent my way of viewing the world in that everything is connected and therefore equally important – the dramatic is supported by the sublime. 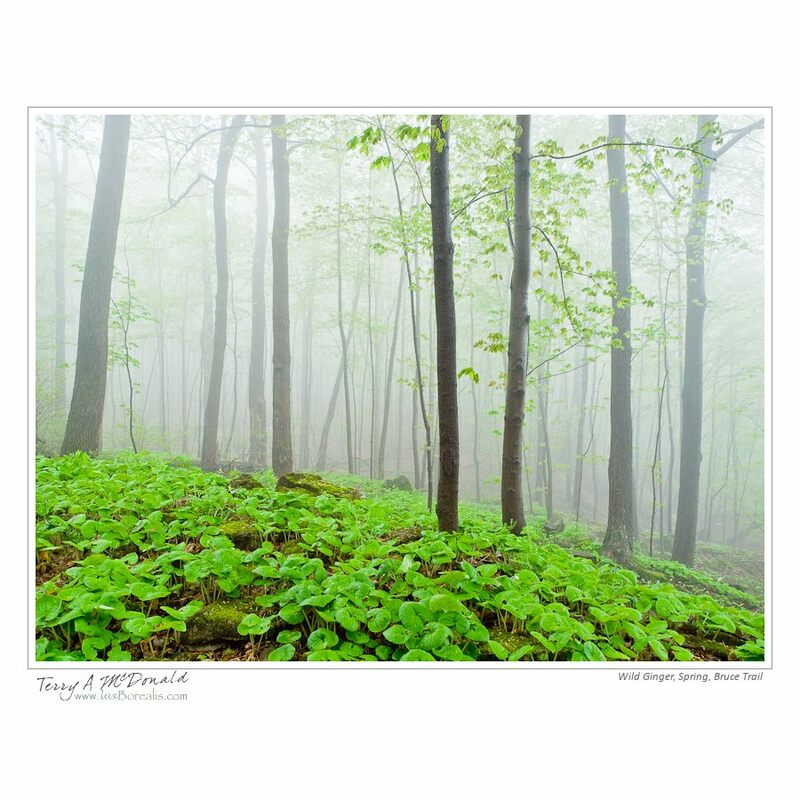 Flurries made at Starkey Hill, Arkell is an example of this, as are Spring Flow and Sparkling Dew. I also appreciate “discoveries” and serendipity. 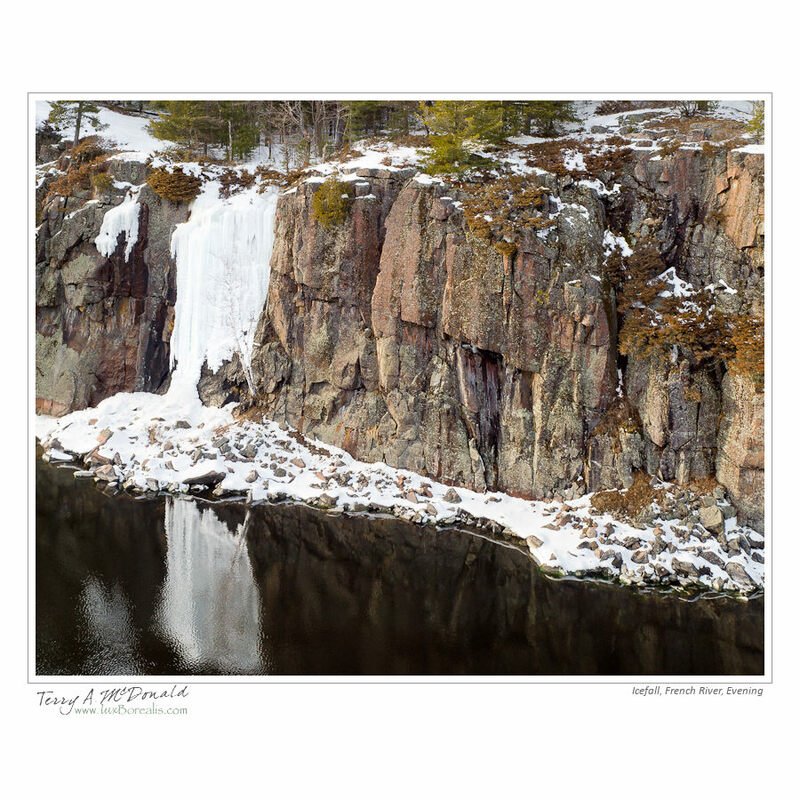 Icefall, French River is one of those moments. On what turned out to be only a day trip to Killarney Provincial Park with Kerry, this photo was made on the way home. Killarney was slushy-warm and not particularly inspiring (which is highly unusual! ), so on our way south we stopped along the French River. Although it was dusk and the light was fading fast, it was a magical time of pastel colours that seemed to be in such stark contrast to the hard Canadian Shield and ice. Serendipity was also at play with Wild Ginger, Bruce Trail. I try to get out on foggy days because the of the added dimension and atmosphere, but this was unexpected: Guelph was clear, but Hamilton, our hiking/birding/photography destination was socked in. Laurie continued to bird while I worked at finding just the right scene and composition to capture this magical moment. 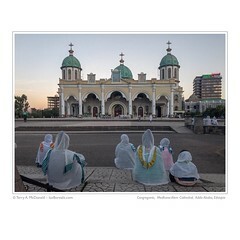 Some of the photographs are departures from what I often shoot; call them explorations of new ways of seeing, new techniques or a different presentation. For example, two photographs are of human features, albeit abandoned and left to the elements. I suppose that’s why so many nature and outdoor photographers enjoy photographing abandoned buildings and machinery: it’s evidence of how nature shapes, weathers and erodes the built environment. Ashes to ashes, dust to dust in nature’s own way. One great discovery tis year has been something I call Motion Landscapes. Being a landscape artist, I’m always trying to extract every bit of detail and nuance from a landscape to make the viewer feel like they are part of it. Motion Landscapes, on the other hand, is the opposite in that I am trying to portray the feeling of the landscape in a very human way – rushing along a highway! So often we only get glimpses of landscapes, so they become a wash of colours and shapes, not details. Two examples of this are Upper Peninsula, Michigan and Canola and Foothills, Alberta. Motion Landscapes are both a new way of seeing for me and a new technique that I will be exploring further in the months and years to come. You will also notice that 8 of the 25 photographs are presented in a square format and others are cropped to an oblong rectangle.. It used to be that the sensor format (or film size) was sacrosanct – photographer felt compelled to “fill the frame” and make best use of every pixel. What I’ve noticed, though, is that some compositions simply work better by not being forced into a pre-determined aspect ratio. Just because my camera is a 4:3 ratio doesn’t mean I must force every composition into that same rectangle. The result of this way of thinking has been liberating. I am still very conscious of using every pixel, but I work so that at least one dimension is used fully, either horizontally with cropping along the top and/or bottom, or vertically with cropping along the sides. Others are the result of pushing the envelope one step further. Moonrise, Dinosaur Provincial Park is an example of pushing my equipment. I use a small-sensor DSLR, one that is not ideal for time exposures because of the noise that’s created. As the same time, I can’t let a scene like this go by without at least trying to capture it. 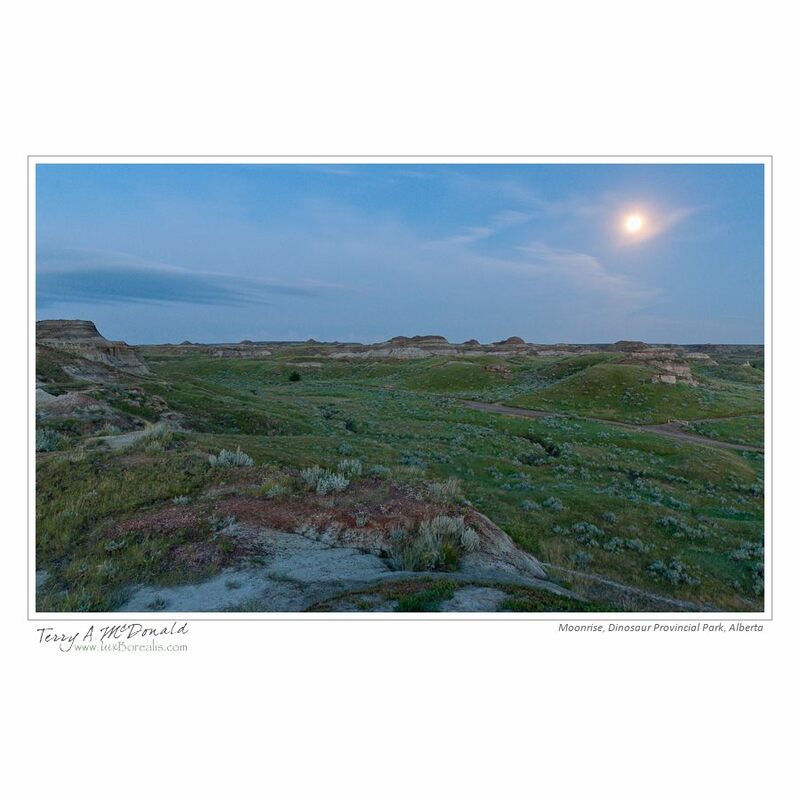 Moonrise is the result – not technically cutting edge, but, to me, it captures the inherent beauty of the Badlands at a time when many are winding down from the day. So that’s an overview of some of my work from 2011. It’s been a good year where I am beginning to challenge some of my pre-conceived notions of what photography is and what it isn’t. A reflection such as this, combined with the work I am exhibiting and the people I am talking with is helping me to better define what I am doing as an artist – and I think I’m on the right track. I’m certainly enjoying the work I’m doing. 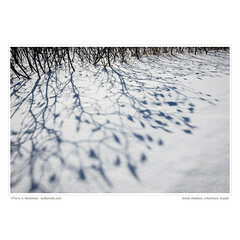 As promised, here is the gallery of 25 from 2011 in full – click on “Flurries” to scroll through in a darkened window. Many thanks Rajan. I always enjoy the photos you post over on the Lu-La forums. I remember that evening on the Musquosh. I sure like your result. Do you still have any of the MW shots below 3-rock chute? Thanks Marty – and thanks to you for guiding us there. Reviewing our work at the end of the year provides retrospective and reveals otherwise unnoticed details about one’s “photographic journey”. I appreciate you sharing your thoughts on each of the themes. One good image that sticks with me from each outing is a goal of my photographic work as well.